The Sentinels are a fleet of satellites designed specifically to deliver the wealth of data and imagery that are central to the European Commission’s Copernicus programme. This unique environmental monitoring programme is changing the way we manage our environment, understand and tackle the effects of climate change and safeguard everyday lives. Sentinel-2 carries an innovative wide-swath high-resolution multispectral imager with 13 spectral bands for new perspectives of our land and vegetation. The combination of high resolution, novel spectral capabilities, a swath width of 290 km and frequent revisit times will provide unprecedented views of Earth. The ‘space segment’ of the Sentinel-2 mission comprises a constellation of two identical satellites in the same orbit, 180° apart for optimal coverage and data delivery. Together they cover all Earth’s land surfaces, large islands, inland and coastal waters every five days at the equator. Both spacecraft are operated by a dedicated Flight Control Team from ESA’s European Space Operations Centre (ESOC) Darmstadt, Germany. Sentinel-2A has been in orbit since 23 June 2015, and Sentinel-2B launched on 7 March 2017. Sentinel-2 is providing high-resolution optical imagery of agriculture, forests, land-use change and land-cover change. It is mapping biophysical variables such as leaf chlorophyll content, leaf water content and leaf area index. It is also monitoring coastal and inland waters and helping with risk and disaster mapping. The Sentinel-2 mission is providing global coverage of Earth's land surface every 10 days with the first spacecraft, reducing to every 5 days once both are in orbit. The satellites' state-of-the-art Multispectral Imager (MSI) instrument offers high-resolution optical imagery. The MSI payloads acquire, store and then download up to 1.6 TB of data per orbit. The data are transmitted to the Sentinel ground stations and via high data-rate laser links to a geostationary telecoms satellite, Alphasat, and via the European Data Relay Satellite (EDRS) system, as well as using the more usual x-band radio data downlink. The Flight Control Team uploads commands and receives satellite status and health information via ESA's Estrack ground station at Kiruna, Sweden. Sentinels-2A and -2B will fly an initial nominal mission of seven years, with extensions possible until on-board consumables are exhausted (each carries 123 kg of fuel including that necessary for end-of-life deorbiting), to a maximum of 12 years. The Sentinel-2 Flight Operations Control Centre is located at ESOC, Darmstadt, Germany. In the routine phase, the Sentinel-2 Flight Control Team comprises six engineers dedicated to Sentinel 2A and 2B, and a team of spacecraft controllers shared between all the Sentinel missions. They work in a control room dedicated to Sentinels located at ESOC under Spacecraft Operations Manager Franco Marchese and deputy Spacecraft Operations Manager Michelle Collins, and in close coordination with the teams operating the other Sentinel missions. The team are supported by other specialists at ESOC, including experts from flight dynamics, ground facilities, tracking stations, space debris and mission data systems. For each launch campaign and during the critical few weeks following each lift-off, the team is augmented by additional engineers and specialists. Franco has more than 12 years’ experience working on sophisticated Earth missions, including CryoSat-1, CryoSat-2 and MetOp-A. He joined the Sentinel-2 mission in 2010, and prior to Sentinel-2A launch in 2015, he was responsible for training and managing the Flight Control Team and for ensuring that that the flight operations 'ground segment' – the systems on Earth that enable satellite control – matched the demanding scientific, technical and operational requirements of the Copernicus programme. Michelle has over 12 years’ experience in spaceflight operations engineering roles on a variety of missions including Metop-A at Eumetsat and Planck at Estec. She joined Sentinel-2 in 2010, taking on the role of systems engineer and deputy Spacecraft Operations Manager. She will take the role of Operations Manager during the Sentinel-2B launch and early orbit phase (more on LEOP here). The team are responsible for all aspects of flight control, including mission planning, maintaining attitude and orbit control, monitoring the real-time status of the satellite and its power, navigation, thermal and propulsion systems, executing orbital manoeuvres and much else. Like many Earth missions at ESA, the ground segment for Sentinel-2 (see more on building a ‘ground segment’) is split into two halves: the Flight Operations Segment (FOS) for flight control and the Payload Data Ground Segment (PDGS) for downloading, processing and distributing the MSI images. This article focuses primarily on the FOS, based at ESOC. Like many ESA missions, the scientific and operational life of the Sentinel-2 spacecraft will begin with the launch and early orbit phase. Following separation of the satellite from the Vega launcher upper stage following lift off on 23 June 2015, an automatic sequence controlled by on-board software deployed the three panels of the single solar array, initiated the rotation of the solar array drive mechanism, and initialised the acquisition of the satellite's ‘local normal’ pointing, so that it could establish a telecommunication link with the team at ESOC via the ground station network. One important system is GPS navigation; Sentinel-2 must deliver imagery with an accuracy of 20m on the ground, so that means engineers must know very precisely where the satellites are at any time, and that is achieved using GPS signals. However, the Flight Dynamics team at ESOC will use ranging and Doppler data extracted from the satellite's radio signal to precisely determine the Sentinel-2A orbit prior to the full operation of the on-board GPS receiver. On Day 2, the team activated the on-board mass memory unit and started to retrieve some of the recorded data, and released the shutter lock on the MSI payload instrument that protects the very sensitive detectors from the light of the Sun. On Day 3, Sentinel-2A performed its first trajectory correction manoeuvres, trimming the orbit into which the spacecraft was delivered by the launcher so to achieve the final height of 786 km, at an inclination of 98.5º – that's passing almost directly over the poles. LEOP for Sentinel-2A was extremely smooth and ended on 25 June, some 60 hours after launch from Europe’s Spaceport in Kourou, French Guiana at 01:52 GMT on 23 June (03:52 CEST; 22:52 local time, 22 June). Sentinel-2B lift ed off on board a European Vega launcher from Europe’s Spaceport at Kourou, French Guiana, on 7 March 2017 at 01:49 GMT (02:49 CET). For the Flight Control Team at ESOC, the LEOP activities planned for Sentinel-2B are substantially similar to that for Sentinel-2A, re-using the robust and proven timeline activities. The major difference is that there is already a Sentinel-2 spacecraft flying and this needs to be taken account in the strategy for acquiring the reference orbit, 180° behind 2A. The strategy is designed to allow the reference orbit to be acquired in a reasonable time, while minimising the risk of collision. The operational phases of Sentinel-1, -2 and -3 (each mission comprising two spacecraft)) are based on a 'ramp-up' approach in terms of exploitation capacity, which foresees gradually increasing the ground coverage for instrument observation. For each mission, the ramp-up phase starts upon the first spacecraft's launch and commissioning, and continues until Full Operational Capacity is reached, with both the A and B craft in orbit (the entry into orbit of 2B leaves just 3B left to launch of the six spacecraft in the 1, 2 and 3 missions). In the Sentinel-2 commissioning phase, lasting about three months from the end of LEOP, the Flight Control Team will be primarily focused on checking out and characterising the performance of all systems including attitude and orbit control, the telecommunication links and thermal and power. The Flight Control Team will also support the PDGS in checking out and verifying that payload performance complies with mission requirements, and to derive a strategy for periodic instrument in-orbit and ground processing characterisation. Following the satellite and ground segment functional verification, calibration and performance characterisation, the In-orbit Commissioning Review will decide whether to declare the Sentinel-2 mission ready for Copernicus operations. Like all the Sentinels, Sentinel-2 is operated so as to ensure reliable operational activities with a high level of automation and with maximum use of pre-defined operation procedures. As far as possible, the ground systems and operations procedures have been developed in cooperation with the other Sentinels to take advantage of the benefits of a common approach. Sentinel-2 is designed to function for long stretches of autonomous operations; both satellites are capable of running on stored commands for 15 days in a nominal mission scenario and remaining operational for 72 hours without intervention in the event of an on-board failure. One major challenge for the life of this mission is reacting to contingencies, should any occur. In the case of the Sentinels, the team have very strict mission requirements stemming from the operational data needs of the Copernicus programme; engineers do not have unlimited time to solve problems as they arise, and so must be ready to react quickly. Sentinel-2A operations in 2015/16, in particular, were very intense, as the team had to manage the routine operations of Sentinel-2A while preparing for the launch of Sentinel-2B. The combination of the large swath width (290 km), multiple spectral bands (13 bands from the visible to the short-wave infrared) and high spatial resolution, coupled with the global and continuous data acquisition requirement (with high-revisit frequency) will generate daily 1.6 TBytes of compressed raw image data from the two-satellite constellation. This corresponds to an average continuously sustained raw-data supply rate of 160 Mbps. Europe's EDRS system will provide data relay services to Sentinel-1 and -2. Each Sentinel will communicate with a geostationary EDRS satellite via an optical laser link, which can handle the large volume of data gathered. The EDRS satellite will relay the data to the ground via a Ka-band link. Two EDRS geostationary satellites are currently planned, providing in-orbit redundancy for the Sentinels. With EDRS, Sentinel instrument data are directly down-linked via data relay to processing and archiving centres, while routine spacecraft telemetry continues to be received at ESA’s Kiruna station, via X-band radio. Prior to EDRS availability, Sentinel data will be sent to ground and received at the core Copernicus stations located in Matera (Italy), Maspalomas (Spain) and Svalbard (Norway) via X-band radio. This data downlink capability will continue to operate in parallel with the EDRS optical data-relay link even after EDRS becomes available. The prime ground station for Sentinel-2 mission control is the 15 m-diameter tracking antenna at Kiruna, Sweden. Kiruna station is used for S-band uplink (sending the telecommands required to operate the satellites and the instruments) and downlink (receiving on-board status information – telemetry – at ESOC). While routine mission operations for Sentinels-1, -2 and -5p are conducted at ESOC, flight control for Sentinel-3 and the Sentinel-4 and -5 piggyback payloads (on other meteorological satellites) will be performed at Eumetsat. The Flight Operations Segment (FOS) – Responsible for all flight operations of the Sentinel-2 spacecraft including monitoring and control, execution of all platform activities and commanding of the payload schedules. The Payload Data Ground Segment (PDGS) – The PDGS is responsible for payload and downlink planning, data acquisition, processing, archiving and downstream distribution of Sentinel-2 satellite data, while contributing to the overall monitoring of the payload and platform in coordination with the FOS. 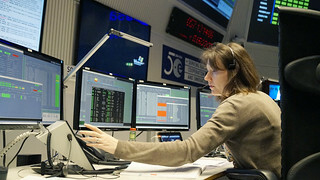 At ESOC, the FOS includes the Sentinel Mission Control System (MCS), which comprises hardware and software for telecommanding, receipt and handling of telemetry, data archiving and processing all other tasks essential for controlling the mission. It also includes the Sentinel Mission Scheduling System, the Sentinel-1, -2 and -3 satellite simulators – to support procedure validation, operator training and simulation campaigns – and the Sentinel Flight Dynamics System (FDS), which supports all activities related to attitude and orbit determination and prediction, preparation of slew and orbit manoeuvres and evaluation of satellite dynamics and navigation. For Sentinel-2, ‘housekeeping’ telemetry from the satellites can be downlinked via the ground station, using a 2-Mb/second link, or received from the PDGS via the x-band downlinks performed every orbit. The satellite design foresees not only traditional on-board scheduling and execution of the flight plan based on time-tagged commands, but also another schedule based on orbit-position tags. The FOS Mission Planning System supports both schedules, allowing different activities to be planned either by time (e.g. platform maintenance) or by orbit position (e.g. payload operations). The Sentinel-2 satellites are 3-axis stabilised Earth-pointing spacecraft. They are based on the AirbusDS AstroBus-L platform, a standard modular platform compatible with European Cooperation for Space Standards (ECSS) specifications. They are essentially configured as a large box, with a single deployable solar array (providing 2300W of power at the start of the mission) and a launch mass of approximately 1140 kg. They measure 3.4 by 1.8 by 2.35 m and consist of an aluminium frame (for the main box body) that provided a structure for aluminium-core honeycomb panels that build up the internal and external structure of the satellite and provide installation locations for subsystems. The mission will provide information for agricultural practices and to help manage food security. Images will be used to detect crop type, and to determine leaf area index, leaf chlorophyll content and leaf water content to monitor plant growth and health. This will be especially important for effective yield prediction and applications related to Earth’s vegetation. As well as monitoring plant growth, the Sentinel-2 instruments can be used to map changes in land cover and to monitor the world’s forests. It will also provide information on pollution in lakes and coastal waters. Images of floods, volcanic eruptions and landslides will contribute to disaster mapping and help humanitarian relief efforts. The MSI is an innovative high-resolution multispectral imager with 13 spectral bands for a new perspective of our land and vegetation. The combination of high resolution, novel spectral capabilities, a swath width of 290 km and frequent revisit times will provide unprecedented views of Earth. For full details on the Sentinel-2 instruments and data applications access ESA's EO Portal.